African Dream Seed is known as one of the most potent dream herbs. You can consume the seeds as a snack, in a joint or in a tea to induce lucid dreams. This Extractis 50 times as strong as one seed. In the traditional healing arts of some South African peoples, African Dream Seeds are used to communicate with ancestors and predict the future. Contains 3 grams of African Dream Seed Extract 50x. In sealed plastic packaging. 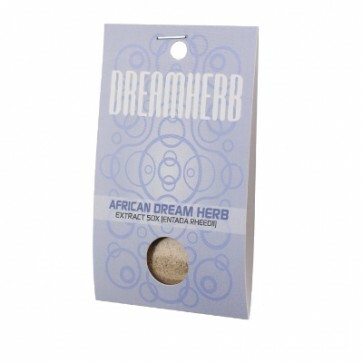 African Dream Seeds are known to be an eneirogen: a dream-stimulating substance. The white seed kernels are said to enhance the clarity of dreams, dream recall, and also to induce lucid dreaming - dreams in which your consciousness is ‘awake’ and you can control what happens. Little scientific research has been done on the active agents in African Dream Seeds. The seeds contain a large amount of alkaloids, fatty oils, essential oils and saponines that could have certain psychoactive properties. One seed can contain up to 18% of essential oils! Odds are that these oils bear the secret of the magical African Dream Seeds. Along with Calea Zacatechichi, African Dream Seeds are possibly the most potent dream herbs known to us. Drink as a tea shortly before going to bed, using 0.5 to 1 gram. It's recommended to use this extract several nights in a row. African Dream Seeds are the seeds of the climber plant Entada Rheedii. This plant is part of the legume family Fabaceae, just like Yopo and Cebil, known for their hallucinogenic seeds. The seeds of Entada Rheedii have a very hard shell and contain a small amount of air inside. As a result, they float on water. Carried by the oceans, Entada Rheedii has spread from the east and south of Africa to the faraway coasts of South Asia, Southeast Asia, and even Australia. In the traditional healing arts of South African peoples, African Dream Seeds are an important product for sangoma doctors. These shamans use this dream herb to induce lucid dreams. These dreams allow them to communicate with their ancestors and predict the future. The seeds also find use in jewellery and as good luck charms. In many parts of the world, African Dream Seeds are used as a medicine to treat all kinds of ailments, such as jaundice and tooth pains, and also to tend to wounds.